Brand: CARSINEL. 100%brand new with unique designs. 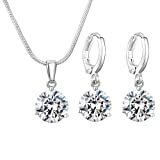 Jewellery Set: includes pendant necklace and lever back earrings. Length of the chain: 40 + 5 cm (adjustable). Material: hypoallergenic copper with AA sparkling cubic zirconia. Size of the stone: 8mm. Suitable Occasions: it’s an excellent gift for anniversaries, graduations, birthdays, or just as a surprise to your girlfriend, wife or mother. Packing: come with a nice soft pouch! It is your reliable choice of fashion jewellery. The designs are unique and elegant. They look like fine jewelry. And the price is cheap. So they are very popular all over the world. However, the material is just copper with three times of white gold or rose gold plated. They can not maintain longer than the fine jewelry in your daily wearing. 1. Please avoid contacting with the acid, alkali and corrosive substances. 2. Please avoid the collision, so as not to scratch the surface. 3. Please put them off when perspire heavily, shower or sleep, etc. 4. Please wipe them with soft cloth before storage. 1. Thanks for give 5 stars feedback with every order to be your valuable customer and keep getting our privilege. We care about our valuable customers and will endeavor to solve any unexpected problems. 2. If you are not satisfy with the goods, please feel free to contact us in time. Negative feedback does not solve anything, we will always do our best to solve the problem and live up to your satisfaction.